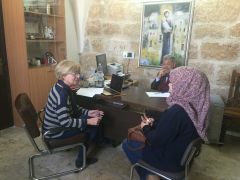 home / Multimedia / The Holy Land in news / Mosaic Centre Training Course: a new opportunity for young ..
Last week, the first selection interviews for the Mosaic Centre Training Course, took place in the offices of the Association pro Terra Sancta in Bethlehem. The Mosaic Centre Training Course is an intensive master specialization in mosaic arts, and is part of the collaborative project with the Mosaic Centre Jericho and the CEI – Committee for Charitable Interventions for the Third World. 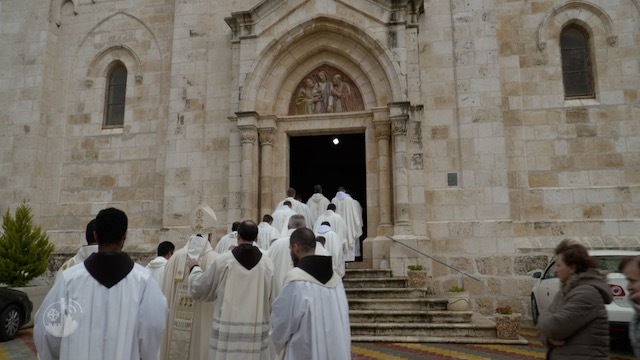 Five young people from Bethlehem and surroundings will be selected. The training consists of 40 hours per week for the duration of three months, focusing on the history and techniques of the ancient Palestinian tradition of the mosaic. At the end of the course, the participants will be able to produce by hand and to restore high-quality mosaics. Osama Hamdan , chairman of the Mosaic Centre Jericho, Carla Benelli, coordinator of cultural projects and training for Association pro Terra Sancta and Vincenzo Bellomo, project manager for the Association in Bethlehem , have met 15 candidates to assess the knowledge and artistic skills required to attend classes . The aim of the project is to train young people from the most needy families in Bethlehem and give them , in addition to a theoretical and practical training , an opportunity at a professional level in the arts , crafts and tourism . It is a precious chance in a stagnant economic environment like the one of the city. Special thanks to the CEI – Committee for Charitable Interventions for the Third World, which has supported the project. Find out more about our projects of mosaic restoration!